Satyam of the Indian Institute of Management in Lucknow, India recently reviewed Steven G. Anderson’s book on strategies for assisting the poor in developing countries, available now in the OnlineFirst section of Journal of Macromarketing. Different perspectives on which developmental approach is the best to tackle the problems of the poor have been debated, while change agents have been trying to address this issue in various ways. The answer lies in finding solutions to more fundamental questions including: What are some of the best ways to assist the poor in developing countries; which development strategies have better chances of success in a particular context and why; what are the strengths and limitations of these social change approaches; and what is the way forward? 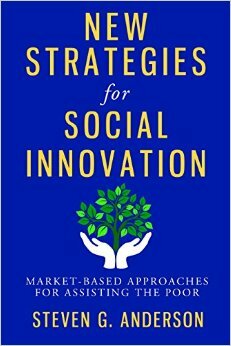 Professor Steven G. Anderson, Director of School of Social Work at Michigan State University, draws upon his four decades of expertise as academician as well as practitioner and attempts to answer these questions in his latest book, New Strategies for Social Innovation: Market-Based Approaches for Assisting the Poor. His book takes the readers through four broad social development approaches that emphasize diverse market-based strategies to improve the life of disadvantaged groups. The book contains seven chapters and is just above three hundred pages in length. The chapters are organized around the approaches described by the author and towards the end an attempt is made to integrate these overarching approaches along with a comparative analysis. You can read the rest of the review from Journal of Macromarketing for free by clicking here. Want to know about all the latest research and reviews from Journal of Macromarketing? Click here to sign up for e-alerts! Do You Have Research on Macro-Social Marketing? Journal of Macromarketing is now accepting research for the Special Issue on Macro-Social Marketing! This Special Issue will be guest edited by Ann-Marie Kennedy and Andrew Parsons, both of Auckland University of Technology, New Zealand. Macro-Social Marketing goes beyond single campaigns for individual behavior change. This is a relatively new area in the literature and many areas of development are possible. Manuscripts could examine the use of macro-social marketing for systemic change, government sponsored social marketing and the ethical ramifications of social marketing. How social marketing relates to sustainability, development, quality of life and history could also be considered. This Special Issue is tentatively scheduled for September 2017, but completed manuscripts must by received no later than February 28, 2016! For more information, including where to submit and contact information, click here! Want to know about all the latest news like this from Journal of Macromarketing? Click here to sign up for e-alerts! A Cornucopia of Book Reviews! Looking for holiday gift ideas or just a good read to relax with over the long weekend? We’ve provided you with three insightful book reviews to sink your teeth into. Saru Jayaraman. Behind the Kitchen Door. Ithaca, NY: Cornell University Press/ILR Press, 2013. 208 pp. ISBN 978-0-8014-7951-9. $15.95 (Paperback). Behind the Kitchen Door is a powerful exposé of the labor practices of the contemporary restaurant industry intended to make the case that the treatment of workers is at least as instrumental to the goals of the burgeoning sustainable food movement as free-range chickens, grass-fed cows, or organic, locally sourced, non-GMO produce. Written by Saru Jayaraman, co-founder of the Restaurant Opportunities Center of New York (ROC-NY), which is the organization that emerged in the aftermath of the tragic deaths of 73 workers at the iconic Windows on the World restaurant on 9/11, the book is a trove of information about industry structure and employment practices. Órla Ryan. Chocolate Nations: Living and Dying for Cocoa in West Africa. London and New York: Zed Books, 2011. 182 pp. ISBN 978-184813-005-0. $14.95 (Paperback). Franklin Obeng-Odoom of the University of Technology, Sydney, Australia published his review in Review of Radical Radical Political Economics. This book is interesting, but strange. It is hard to dismiss, but difficult to call a masterpiece. The book talks about two countries without being comparative, but in a way that helps comparative studies and thinking. This is a book about the raw material that is used to produce the chocolate you have been eating, about the fair trade you have been supporting, and about how the output of smallholder farmers acts as steroids for the economies of entire nations. Wallach, Jennifer Jensen. How America Eats: A Social History of U.S. Food and Culture. Lanham, MD: Rowman & Littlefield Publishers, Inc, 2013. 240 pp. ISBN-13: 978-1442232188. $24.95 (paperback list). Bobrow-Strain, Aaron. White Bread: A Social History of the Store-bought Loaf. Boston, MA: Beacon Press, 2012. 257 pp. ISBN-13: 978-0807044780. $17.00 (paperback list). Kim K. McKeage of Hamline University wrote a review of both of these books, which appeared in the Journal of Macromarketing. From the titles, we get a hint that How America Eats: A Social History of U.S. Food and Culture and White Bread: A Social History of the Store-bought Loaf occupy opposite ends of a spectrum. Both are social histories, and both are concerned with food, but one is a wide-ranging history of all things food related, while the other focuses on one item – commercial white bread. How America Eats is a rather impersonal account, while White Bread is embedded in the author’s own experiences and ethos. The differences in perspective, though, provide what turn out to be remarkably similar insights into American food history. The Journal of Macromarketing has announced two new Calls for Papers. Submissions of papers should be sent no later than Monday, January 9, 2012. Proposals for special sessions should be sent no later than Monday, January 9, 2012 and must include a rationale, an outline of the issues to be discussed, as well as names and relevant qualifications of the proposed panel, workshop and session participants. For more information about the Call for Papers, the Proposals for Special Sessions, or the conference, please click here. The second Call for Papers is for the Fourth Subsistence Marketplaces Conference, which will focus on the theme of “Subsistence Marketplaces to Sustainable Marketplaces: From Micro-level Insights to Macro-Level Impact.” It will take place in Chicago, Illinois between July 27 and 29, 2012. E-mail as a Word document to Madhu Viswanathan, University of Illinois at Urbana-Champaign at mviswana@illinois.edu, Cliff Shultz at cjs2@luc.edu, and Srinivas Sridharan at srinivas.sridharan@monash.edu. They are currently exploring the possibility of a publication that is partially or fully based on articles stemming from presentations at the conference. For more information about the Call for Papers, Submission for Publication, or the Conference, please click here. If you would like to learn more about the Journal of Macromarketing, please follow this link. Are you interested in receiving email alerts whenever a new article or issue becomes available? Then click here.